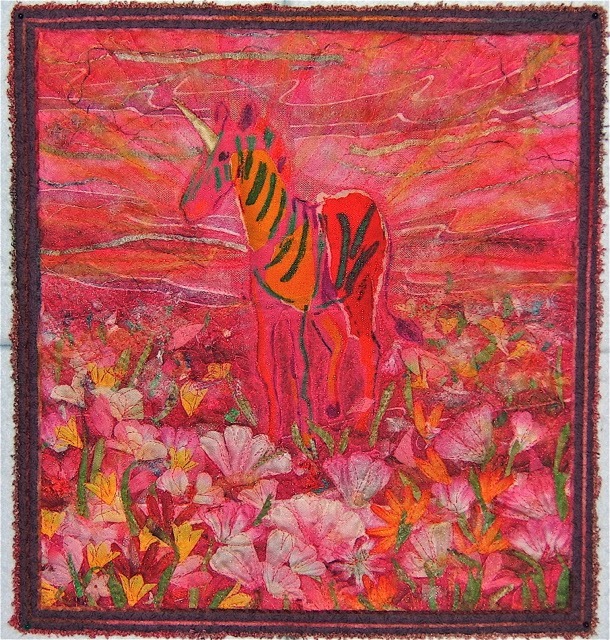 Here's hoping you're "in the pink" ... that you find time in your day to imagine or create something out of this world. This piece was made just for the fun of it quite a few years ago. I liked the challenge of working with all that pink. It's constructed in my "ortwork" technique and I think the size of it is about 12 inches square. It was donated to the Smoky Mountain Quilt Guild small quilt sale back then. This is such fun Nellie - those colours really glow. Very delightful. His he a Unizeb a zebacorn? This one makes me smile! What Fun! AND have a wonderful Valentines day too! What a great, colourful, imaginative piece! It would look really great in a shadow box frame.